This is just the upper quadrant of the body moving/folding as a unit. It is a QUARTER-BODY move. In the case shown in the video, the right side of the body is folding or unfolding by keeping the left side of the body stationary. The stationary part provides support, some of the power for the move but the lower 2 quadrants (legs) provide grounding. The Right side of the body is yang, the left side of the body is yin. The Yin-Yang junction is at the spine. One can visualize that the spine is a hinge, so each side of the torso, down through the buttocks is like a door which folds or unfolds using that hinge. If the leg was involved in the movement, it would be a HALF-BODY move. Even though only a quarter of the body is moving it is still an important example of how to make a move but still keep a portion (in this case 3/4 of the body) still. It is also of importance as an example of how to make a move but keep a significant portion of the body alignment intact. Whether half body or quarter body, whether the leg moves with it or not it can only be achieved when the turning power comes from the waist and the entire back's muscles. If this is done correctly , one will achieve a continuous energy flow in the body. It is a "neigong" exercise. It is tailor made to be a "silk reeling exercise" which might be defined as a continuous symmetrical simple internal movement or movements. Doing this, one will be able to learn gradually how to move with internal discipline and enjoy the sensation of internal energy circulation. This exercise emphasizes the stimulation of muscles, tendons and blood flow along the spine and the back. Those who practice this regularly experience a sense of rejuvenation and improved well being. If one has spare moments during the day, particularly if the exercise can be carried out in a casual and relaxed mood, there will be more chance for the subconscious to play a part. The ultimate objective is to learn internal movements like this in more or less a piecemeal fashion then integrate them into the Form play. Form and Martial Intent "Golden Rooster Stands on One Leg"
Video Form and Martial Intent "Golden Rooster Stands on One Leg"
Silk Reeling and "The Upper Body Turning Movement"
Master Stephen Hwa speaking of the quarter body movement, half body movement and upper body turning at a workshop 2011, Buffalo, NY. The video is here: "Upper Body Turning"
In speaking of Silk Reeling another movement is the “turning” movement. You keep the pelvis fixed and you turn. The buttock is fully engaged actually. The buttock function will keep the pelvis from not turning. So when you are turning up there the buttock is holding the pelvis. As usual, with this one, I find more people have problems when you teach this. The problem is getting the shoulder away from the turning movement. If the shoulder has even a little bit of initiation in the movement you lost it. Don’t use the shoulder. Everything is in here (core, lower abdomen). The shoulder is just a slave following the movement. Anybody have any questions on this turning movement. “Do you practice with a tuck”? Yes, because the buttock is involved. You feel the buttock is energized and holding the pelvis. “Master Hwa, at the end of the turning movement, is there a sense of a denser contraction that is happening”? Well, a lot of places you feel the contraction. When you turn in this direction, without moving the pelvis, your buttock is supporting you. I guess, initially it is relaxed back to the neutral position. You could relax to the neutral position or you could energize back to the neutral position. You probably want to energize back to the neutral position. Because when you have an application you may have to energize any segment of the turn. So you want to energize back to the neutral position. I think you want to energize so you are intentionally turning back, rather than just relaxing back. Try to get the shoulder away from any of the movement. I notice on this side, you get a little bit of drop of the shoulder. Good, very good. Do you find how much energy is involved in making this movement, compared to turning at the pelvis…because it is moving at the abdominal area. So this is another silk reeling exercise. Boy the beginner just eat it up. They can feel, and they feel somewhere they never have sensation before. 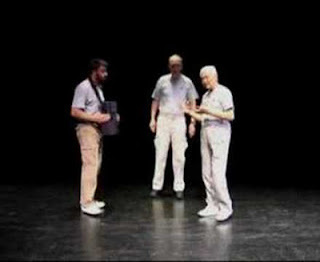 "Here is quite a good and believable demonstration of fajing, or the explosive delivery of internal energy, by Stephen Hwa, who teaches taijiquan at the University of Buffalo and in Fairport, New York." Master Hwa does not still teach at the University of Buffalo or Fairport, but he can be reached at info@classicaltaichi.com. 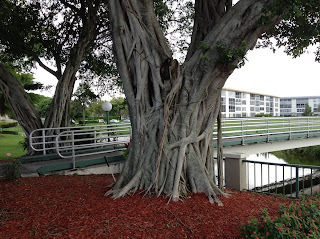 Presently, he teaches in Pompano Beach Florida where (while in the springtime of his life) he enjoys Florida's perpetual springtime. "He shows the “one-inch punch” made famous by Bruce Le (see below), who at the 1964 Longbeach championships knocks someone into a chair, without any windup, his fist starting an inch away from the target." I think it is a matter of opinion as to whether Bruce Lee does the punch "without any windup". Notice his fist does start close to the man's chest (near solar plexus?) you see him touch the man's chest a couple of times before delivery of power. If you look carefully you can see the man sway gently as Bruce's fist makes contact on a couple occasions.As he touches the man's chest, Bruce is also seen adjusting his foot stance with his back foot pointing almost 90 degrees out. "Master Hwa shows how it is possible to generate this power using the taiji “hollow-fist punch.” He explains that other people have recreated this but using “external” or purely muscular power. In his demonstration, he has his "hollow fist with pointed knuckles" pressing against the pad held to another person’s midsection, while someone else holds onto his bicep and forearm, to feel his muscular contraction. With the "hollow-fist punch" the reasoning is the same as why he maintained a relaxed arm. Bruce's fist is clenched tightly, the arm is extended almost fully. With such a clenched fist the arm cannot maintain relaxation. Try this yourself, clench the fist tightly and notice the effect it has on your arm, then on your body. The use of muscular power is evident in Bruce's punch with such preliminary muscle tension, it is "external" power. When the punch is delivered, one can see him pushing from the back foot as well. Force generated from external limbs such as arms and legs has much longer duration and cannot be compacted into such a burst as possible with "hollow fist" and relaxed arm. "With seemingly little effort, he knocks back the man holding the pad, who feels a sudden surge of power. The man holding Hwa’s arm says it is relaxed before and after the punch, with only brief tension as the power is delivered into the opponent. Hwa explains that if the arm tenses before the power is delivered that the force will be greatly reduced." The "knocks back the man" is more detailed than appearance would have us believe. This is so because of Tom's body structure and Master Hwa's as well. Ideally, one has to have a better body structure than the receiver. Bruce Lee has a body structure incomparably better than the receiver who stands flat footed with feet together. Compared to Tom, Master Hwa's body structure is poor and it is the receiver who has better structure. The "reaction force" (Newton's Law of action and reaction) will push Master Hwa back instead of Tom. To explain this better we refer to the term "Peng" which is one of the 13 movements of Tai Chi. Peng for the most part has a major component which is an uplifting force. It lifted Tom partially off the ground, then a minor forward force (the knock back portion) knocked him back. In this case M. Hwa's tight compact and upright stance has the advantage as the reaction force is absorbed straight down the body into the ground. Actually, Tom did not receive all the "explosive" energy possible because of the pad. As Master Hwa demonstrated on an amateur boxer (familiar with body punches) even a punch of reduced power with no pad results in the receiver collapsing (Uncovering the Treasure pp.109). hollow fist reaches the opponent. Also, Bruce uses the whole fist whereas Master Hwa forms the knuckles into a hollow fist. The analogy is like that of "holding a robins egg". One can imagine that or clenching the fist either before impact or even during would crack the egg, would it not?The hollow fist has pointed knuckles not tightly held and it is designed to strike at soft tissue and not a bony part where it would hurt the fist. The stiffening is a natural response to the feedback of a sensation of resistance". A side note to this is whether the opponent or target is like, or one might say, analagous to a "creampuff" or a "side of beef". In the latter the resistance will be instantaneous thus providing instantaneous feedback to such a pronounced sensation of resistance. If "creampuff" like with no resistance, there will be little or no delivery of power. I had a recent discussion with Master Hwa who is a Ph.D., chemical engineer (and this got really interesting for me) about terms like "time constant".My layman's understanding is that all materials have a "time constant" in their elasticity. Well in this case, the force is coming at Tom (as Master Hwa later says) with so much force, so much speed it creates a "time delay" (irrespective of the "time constant"?) in Tom's body going backwards. Measuring how far the punch penetrates during and after the pad is really only about 2 or 3 inches of compact movement. Regardless of that it still penetrates into Tom's body and one might say completely. I call it an "implosion", on the inside of Tom's body as opposed to an "explosion" on the outside. He receives the whole force before his body begins to move back, so much for "pulling the punch", don't you think? It is aptly called a "spike" of power because like a spike, the opponents body has no chance to get away from the full force. Now, one cannot get "internal discipline" and cultivate "internal energy" by external movement so it has to be learned from the Tai Chi form. In all fairness to Bruce Lee, rip, he might have been pushing the opponent in order not to really hurt him, thus diminishing his force. After all, he did not use a pad and the potential for injury was great because his fist looks like it was spot on the solar plexus. Either way you can come to your own conclusions and I humbly hope I have provided some additional observations based on my own experience as a practitioner/teacher of the art and as the individual who was lightly touching Master Hwa's arm. I know that Master Hwa has consistently examined his own movements and tries unceasingly to come up with better ways of teaching. Additionally, he maintains the desire to share his own discoveries with his students. There are of course some students who develop what they learn from the teachings naturally by just practicing. I believe he is right in thinking that his desire to shorten the learning curve might be viewed with a disapproving eye by old masters. After all, they believed in diligent practice and self-discovery. Master Hwa is well aware of this concern and relates it to Mencius story about a farmer who was impatient watching his seedlings grow so slowly that he went to the field and pulled the seedlings up to help their growth. My understanding of the story is that the pulling up to see the results resulted in the plants dying. Intuitively I think that Mencius wanted to illustrate that successful cultivation of personal virtue was a long term process. It is a satirical thought indeed that anyone can be impatient for success yet act to destroy the very conditions upon which success depends, or hastens growth yet hopes for success. Here is one discovery that I have made: The desire for success is a self imposed obstacle to success. As a Westerner, I think I have self imposed things standing in my way that make living Tai Chi very difficult. I know that I am not immune to the many feelings wherein one needs success and needs it in a hurry - in things other than Tai Chi as well. So the question of what Tai Chi can mean to me particularly in light of these self imposed roadblocks is ever more important. Although Master Hwa feels the need to shorten the learning curve, I don't think he should ever regret it. I hope I am not being too bold when I say that Tai Chi has had a difficult time in the West. For one thing the ground that he planted Tai Chi "seedlings" in is as I say, in the West. One might also say that it is needed very much in the West, but the ground is not the most fertile considering the obstacles, albeit self-imposed . If anything I think his efforts to shorten the curve were necessitated by forces that may well be difficult to control as I state above. I have encountered no other Tai Chi learning as he teaches where students are taught to zero in on the correct sensation of a movement. I have found that this is truly the best tool for achieving self-improvement. One learns to sense the gradual discoveries of their own body which have been "under ground" for perhaps their entire life - how can this be called "pulling up"? The health implications of this are incredible for the sensing of gradual discoveries is a direct pointer to how well the nervous system becomes both healthy and well "tuned". One doesn't have to look for results, one can feel them. Master Hwa: "You know sometimes, as I recently wrote in the book about discoveries. And it is still continuously discovered. For example, we talk about rotating this arm, your arm is up a little bit? OK. Before I kind of said, now, because you rotate up, elbow is down. So now you can go down like this. But really that rotation, HAS LOTS MORE MEANING TO IT. So you understand because you are nodding your head right? You know, you try with one hand, you can see. So, one hand you rotate, ok, you rotate then you start moving again. MORE. You see this move, starting with this rotation. This is a very powerful move. Right? Starting with this rotation. Once you start to move this... So again, I just, just ...Ohhh, these old masters, they really think about everything. This is a very powerful move...for blocking, and later on, you can feel the power. Right...very good, right, exactly. Right and also later on, when we talk about push hands, there is other uses for this move too. You, know, so early on, I just followed my teacher, turning but. Now I really understand, why, so important but. Two hands is actually more difficult, so your both hands come down. You know most of the Tai Chi forms when they do this, they pull the arms back like this. It is NOT, we really do THIS. It is more difficult than one hand...both sides actually. Student: "At that point, it is a feeling in the back?" Master Hwa: "Yeah, the back, my back goes down. That's how the back goes down. It's easy to illustrate it using one hand but two hands is a more difficult situation. Yes the SHOULDER SINKS. " "Now two hands can also be used for blocking, Or, when someone comes underneath you, you strike him on the back with the elbows. The shoulder goes down." "....Classical Wu Style Tai Chi with other martial arts..."
"Mastering others is strength": There is no end to the use of strength and there will always be others who are stronger, others who can learn to counter your strength, others to compare yourself to, in light of what is said in the Blog, why engage in such comparisons, there is only one of you however, "Mastering yourself is true power". "How can such a soft, slow moving Tai Chi Form be preparation for martial arts?". I guess some people missed this chapter in Master Hwa's book, for he says this and then explains. At about 4:30 of the video we hear even a long time student repeat the same refrain: "How does Tai Chi fare against Brazilian JiuJitsu?". You can hear the refrain echoed in a thousand Youtube Videos and in those same videos you will sometimes hear the fighting capability of the individual asking the question. Speaking only for myself, I have never been bothered by this question AND for myself there are far more important questions I ask of Master Hwa. I flew to Florida over the weekend of May 11 (the Jet Blue tickets were my birthday present from my wife Barbara) and spent a great, long weekend visiting with my teacher Master Stephen Hwa and Eva. After I wrote thank you emails, I sent a hand written card of thanks to Master Hwa and Eva for their wonderful generosity and hospitality. While I was there, he would come to the apartment at least 2 times a day and spend hours at a time with me on my form, one might say I lived with him. We also ate all our meals together, we took walks together, the training went on nonstop. I asked question after question about my form and he never wavered in giving answers about my form. I had hour after hour to both question and do my form for him. Not once in all of that time did I think of saying: "How does Tai Chi fare against (insert your martial art)?" Perhaps it is because I finally realize in my heart, there is no end to it and more importantly, I cannot put an end to it...for it truly is endless. How do people miss hearing him say: "There are no winning strategies, applications, etc. (insert your martial art), there are only winning executions of those strategies, applications, etc."? Listen to 4:30 of the video in response to: "How does Tai Chi fare against Brazilian JiuJitsu"? Here is the link to the Youtube video from a workshop in 2011: "...Classical Wu Style Tai Chi with other martial arts..."
Master Hwa: "You know this is all individual. You know, we practice the form and we can reach a certain stage and this is called Mastery. You know you can learn and do the form so that every move is internal, that you don't have to think (about what comes next) . You know at that stage, you are mastering the form, BUT with martial art application, there will be no mastery. With martial art applications there is endless improvement. So it's harder to compare one to the other. " "You know when the first Tai Chi master went to Beijing most Tai Chi was in the countryside, and people don't know that much. So he went to Beijing, liked to challenge people and beat up everybody. So he went to one master there and wanted to challenge him, "Oh, I know you are better than me now" the master said. The challenger said "Please let's just do some". He just wanted to try it out on other martial artists. Sincerely, not to just build the name, so he begged the guy. "Let's do something"
"So in that sense, at that time, he beat up everybody, there is no other martial art that can beat him, Certainly at that time, consider your knowledge, that is another thing, people do not know about Tai Chi. So people may not have developed a way to counteract it." "Now if you know Tai Chi like in the fight between Wu Gong Yi and the other guy. Now both sides know each others art very well. Now, I'm sure they both develop a strategy to counteract the other guy's strength. Now the other guy, if you watch the video (click here for LINK). Now I know (pointing to Jim) you watch it many times, you find (the other guy an "external" White Crane martial art) he changed the way, in other words, he doesn't use momentum, body momentum at all. He knows the Tai Chi is really good to counteract momentum, body momentum. Body momentum, that is what Tai Chi is really good at. And he just chopped away, just using his arms, so there is no body momentum...remember that? There was just a flurry of arms without any body momentum. Certainly in that way, he cannot develop all the power and so forth. At least he tried to avoid being thrown by the Tai Chi. In that case Wu Gong Yi is not using Tai Chi, you cannot blame him, because the guy is not using body momentum. So at that time (and even today on Youtube) people are saying how come Wu is not using Tai Chi? So he is not using Tai Chi and so everytime, he has to block. So he is using this (side of the hand) and hitting him (on the arms) and after awhile. So after awhile, the guys arms got tired because the muscle got hit. So he, himself, goes in and hit his nose (he walked into Wu's blocks and his nose started bleeding profusely). You cannot blame him for not using Tai Chi because the other guy does not use body momentum (he moves, I move, if he does not move, I do not move). So the guy did this with his arms and Wu did this to block him, block his chops. One of his hands he cannot raise or something." Correct Stepping in Cloud Hands and "Yin-Yang Pairs"
"The way leads from the sacrum upward in a backward-flowing way to the summit of the Creative and on through the house of the Creative; then it sinks through the two stories in a direct downward-flowing way into the solar plexus and warms it. Therefore it is said: "Wandering in heaven one eats the spirit-energy of the receptive". Excerpted from : "The Secret of the Golden Flower: A Chinese Book of Life", Richard Wilhelm, Translator, Translated from German, Cary F. Baynes, C.G. Jung, Commentary, see p. 61 for the passage. Richard Wilhelm, C.G. Jung and Cary F. Baynes also being collaborators on the Wilhelm/Baynes edition of the I Ching or Book of Changes. In the context of "secrets", I see that there is no shortage of books being published that tout learning "...the secrets of Tai Chi..." in some cases they claim that the "secrets of the masters" are to be found in the "Tai Chi Classics". Certainly we know that there have been high level masters of Tai Chi in the early days but as Master Stephen Hwa states: "These Classics started becoming known in the 1930-40s when books about Tai Chi first started to be published in China. These writings reported in those books are a collection of short works attributed to different authors from Chang San-Feng to anonymous authors. Even though their authorship cannot be verified, they are considered to be the holy writ on Tai Chi. They do contain some insights and principles of Tai Chi; but also some glaring mistakes." We know now however, that regardless of any supposed or real literary accomplishments, the early masters structured the Tai Chi form to serve two purposes: It was designed to be useful for martial applications and also to be good for health purposes. One has to admire the thinking behind such structure and I think it can be safely said that it was designed by people with sound reasoning skills. Reasoning however that was no doubt based in whole but certainly in major part of their own martial art experience. Thus we have the 2 major components of the "logical structure" of Tai Chi but they built it with an understanding that it need be composed of many facets or building blocks for the structure. An example of only one building block but a major one is how "...every move in Tai Chi needs a moving part and a stationary part (yang and yin)..." Those "parts" come together at junctions in the body, some can be in the torso, some can be outside of the torso. These junctions can be said to be the repositories of the two parts or what are "yin-yang pairs" but regardless of what they are called, their location whether inside or outside of the torso is what is of major importance. "Correct Stepping in Cloud Hands with application"
"Correct Stepping in Cloud Hands showing pullback"
I will let Master Hwa do the rest because I can certainly explain it no better but will conclude by saying IMHO that the movement you see in his back is the characteristic "ripple effect". In this video you see the force, an "intense muscle undulating motion" . This is a premier example of the saying about Tai Chi that it is "outside cotton but inside steel" . In my humble opinion or at least conjecture, I see parallels in the up and down motion of his back or "undulating motion" and how this is described in so many writings about Taoist meditation (see the Golden Flower comment). Or parallels as to how the "chi" is "tapped" along the spine, travels to the extremeties, then moves back to the body core for further use. On the other hand, although I think the Secret of the Golden Flower is written in such an ethereal style (it has been long associated with "hippy-dippy, flower style Tai Chi of the 60's in the U.S.") that it is almost unintelligible to me in English, there is nothing ethereal about what we see demonstrated by Master Hwa, After all, and as we correct our stepping in cloud hands, it is as Master Hwa says in Uncovering the Treasure: "...a bad posture will stop internal energy generation and qi flow. No mental state or wishful thinking, (etheric or otherwise) can overcome that". "I am new to Tai Chi, (practicing for the last two weeks!) and I've been trying to learn the square form from the DVD, before tackling the round form. I can do the first two forms (preparation and raise hands)but am encountering some difficulty in the transition to the third (Hand strums Lute). Obviously I am doing something wrong, since Master Hwa does this effortlessly in the DVD. I did check that my weight is fully on my right leg and the left leg is 'empty'. I'm sure my body is stiff (which is why I'm doing Tai Chi! ), but I can't figure a way to put feet 90 degrees to each other without straining the weight bearing knee. If anyone has encountered this before, I'll be very grateful for any suggestions." 3. "Hand Strums the Lute...."
In further consideration of the above instructions and what you say about “torque in the right knee but nothing very painful”. I would spend more time paying attention to details of the lower body and forego the upper body movements for now. In other words, do the stepping, weight shifting of the square form without raising the hands and arms whatsoever, put your hands by your sides. Do this just as though you were doing the basic walking. The basic walking is the lower body work of the square form. You may wish to consider holding onto a post as you practice these lower body movements, just as Master Hwa teaches in one of the Youtube videos. This will stabilize your upper body and further lessen the chances of becoming uncomfortable. I do this “post” work, even such complex foot movements with my students and they seem to relish not subconsciously worrying about their balance. There is not much discussion in Tai Chi instruction “out there” with such iteration about protecting the knees as Master Hwa provides in the DVD series. For the most part, however, he addresses the mid size stance which is an optimum choice for most entering students. Too large a stance or incorrect/insufficient knee bend. I If you had a knee problem before, your first order of concern is to protect your knee. When you are comfortable with your knee and can do the lower body form movement found first in the walk, or doing form movements sans the upper body, then add upper body work. A student once wrote the following: "I just completed my first lesson -- the walk. Very tricky but also very fun. This is going to be exactly what I have looked for so long. I have always loved to dance but never enjoyed performing for people. This dance of Taiji will be that dance I have been needing for so many years!" Master Stephen Hwa wrote in response: "I am glad you have made a good start. It is important that you feel fun and challenged while you doing it. Your comments about Tai Chi as a kind of dancing is what prompted me to write about the topic "Yi" – the martial art intent. I remember my teacher became unhappy when someone referred to Tai Chi as an exercise. Again, the “intent” is lost when it was called as an exercise." I can't remember a time when I ever thought of calling Tai Chi "exercise" and/or "dance"...although I hear of or read of people referring to it as such. This puts Tai Chi as no better than pedalling away on an exercise bicycle while watching television. Since dance also qualifies as exercise, then Tai Chi in many minds also falls into the same "exercise/dance" genre as "Sweatin to the Oldies". I will always correct my students as well when I hear them refer to it as "dance" or "exercise". Although it is not surprising that people do this for I once had a student argue with me that Tai Chi originated in San Francisco and not in China. Given that it did originate in China and given that Grandmaster Wu Chien Chuan, as an "originator" of the Wu Style of Tai Chi was an officer in the Imperial Palace Guard...can we come to the understanding that it is not "dance" nor "exercise"? In fact, in his "Six Essential Elements of Practicing Tai Chi", Grandmaster Wu stated that the "first thing to be avoided as taboo in Tai Chi is to apply "Li" (muscle and awkward power). All the movements should be poured forth with the "Yi". He continues by saying: "In moving the hands up, they are not automatically moved up without consciousness. It is the Yi which moves them up. While the Yi is not stopping, the movement will not stop. At the moment the Yi stops, the movement instantly stops." "...beginners...should avoid the vain attempt of applying li, then they can gradually get away from prosaic and mechanical practice..."
So far "exercise" without intent is mechanical, prosaic (it is indeed commonplace), it uses "Li" , which is no more than muscles/muscular force and for the most part is certainly awkward, lacking in skill and most definitely clumsy. To show how widespread the misconceptions about Tai Chi are, I recall students saying "I bet doing more situps will help", "I have some belly dancing videos that I am going to look at now", "I can bench press 250 pounds, now how can that not help", "The Tai Chi looks like Ballet", "I do Karate, so all I have to do is my Karate in slow motion and I will be doing Tai Chi". Addressing just Karate and leaving belly dancing and ballet for now I know from extended personal experience that "Karate" does solo forms that are called Kata...I did some Shorin Ryu Karate. In Tae Kwon Do, we called it "poomsae". I did these forms with lots of power, "snappiness", lots of "kiai" (sounds like yelling) and as much speed/acceleration as possible...moving like there was an opponent Someone watching could say, "yep, he is fighting an imaginary opponent, that is obvious". It was challenging doing the Tae Kwon Do because I was also doing Wu Style Tai Chi at the same time in Toronto. Poomsae had very tense arms/forearms/fists with stacatto movements but my Tai Chi had/has relaxed arms with continuous movement. Yes, I felt the movements in Tae Kwon Do were done from muscles in shoulders, upper chest, arms, etc. In the case of Classical Tai Chi as Master Hwa says: "The Yi in Tai Chi is therefore purely mental". I certainly have taught weightlifters, ballet dancers, karate practitioners, etc., and for some they seemed to grasp what "Yi" is. For most I saw that it was not easy to get and "intentions" to do something else with the movement usually began to show...early on. The dancers would not keep their heel down on the back foot and would rise up on the toe, with "fluorish" type movements in their hands. The weight lifters were incredibly stiff and inflexible around the upper chest and shoulders, the internal discipline of the core would elude them. Karate people seemed to be stuck on a permanent type of stacatto movement, making movements continuously seemed to elude them. I recall conversations with one long time Karate practitioner who said in so many words that he could not understand why anyone called Tai Chi a martial art. The implication being that only Karate (or at least "his" Karate) could be a martial art? For the most part, I think that all of those folks engage in superfluous/extraneous movement of the extremeties. If there is superfluous/extraneous movement, there can be little if any "Yi" or intent in movement. At this point I must defer to what Master Hwa has written so well about: "Extraneous motions, or nerve signals, along the path of Qi, such as shoulder, elbow, and arms, have the same effect of disrupting the flow of Qi between the body and the fingers. People who use their hands intensively, such as dancers, typists, and piano players could have such problems. It is important for them to keep localized nerve activity dormant and let the Qi from the body take over. This is a good reason to learn the square form from which the practitioner will get used to movements with steady arms and hands without localized impulses." Tai Chi Form should be practiced with “Yi” (martial art intention). “Yi” is not something complex and elaborate. It is single minded and somewhat intuitive with the desire to deliver the internal power externally through hands, arm and foot, what ever the movement is. If the hand is moving forward, then the Yi goes to the palm and fingers; if the hand is moving laterally in a blocking movement, then the Yi goes to the leading edge on the side of the hand; etc. Once the practitioner masters the “Yi”, it is no long a conscious effort any more. It becomes subconscious and comes naturally whenever the practitioner makes a move. At this stage, when you play the Form, you have both the internal energy and Qi (nerve signal - a simple-minded definition) circulating in the torso of your body. With the “Yi” as a catalyst, the Qi is able to flow to your hands and fingers while the internal energy continue to circulate in your torso until you need it for an application. Then the internal energy will follow the Qi to the arms, hands, and fingers for delivery. follows hand. Shoulder follows elbow. Hip follows shoulder. following the feet is also wrong." Thank you for the comment. I see that you are a student/teacher in a "branch" of the Wu Tai Chi style; I am as well. I was also a student in another "branch" for many years. That branch "turned the hip" as opposed to "turning the waist", they "started movement with the hand" as opposed to "mobilizing the extremeties from the waist". One "branch" within the Wu Style raises their arms very high above their heads, Classical Wu Tai Chi does not do this. I will not argue the point from the perspective that one is right while the other is wrong, I would definitely have my work cut out for me in doing so. It seems however, you are stating by implication that if something is natural, eg., “natural movement” then it is somehow good, thus implying that what is unnatural, eg., “unnatural movement” is bad. This characterization of “natural” presents many problems. I am sure that even if we agree some things are natural and some are not, what follows from this? Nothing. In other words I do not see facts presented to support that what is “natural” movement is good (right) and what is by implication “unnatural” is bad (wrong). Stating that “movement starting with the hand” is true to the extent that (as we already established) some schools even within the same style (Wu in this case) will start the “six harmonies” ( 1)hand follows 2) foot, 3) elbow follows 4) knee, 5) shoulder follows 6) hip by using the hand first. In this case, I see you are from the "Wu" school. I also see that you do not mention the use of the core, the "hands" connection to the core, the foots, the elbow's, etc. Stating about the “six harmonies” being “wrong” as presented here in Classical Wu Style however is not sound. Simply stating the premise that “movement” is “wrong” because it is not “natural” does not make or present facts to make it “wrong”. There are however certain observable things that one can take note of: Here, in Classical Wu Tai Chi, the movement does not start with the hand, it starts with the waist. In using the hand to start first, one is using an extremity of the body and whether in Classical Tai Chi or any Tai Chi it is initially reducing or draining off some of the power of the movement, as the movement is not initially connected to the core. Tennis players, baseball players, golfers, , etc. make use of an external movement first with the arms/hands then it is connected to the core, presumably for power, once the arc of the swing reaches the proximity of the core. The act of using the hands/arms first however does not mobilize the core of the body before the fact effectively, for it is the core itself that should be used to mobilize the hands, arms, legs, etc…the extremeties. After all, we are talking about Tai Chi for health and martial purposes and not baseball. Hand and arm movements in and of themselves are abstract in nature, when not connected to the core of the body they lack strength and cannot move in a relaxed manner. This to excess in Tai Chi makes hand and arm movement merely extraneous. By using the hand first and thus allowing the arms to move independently of the core you are compromising the movement and diffusing the neuromuscular signals for the core of the body to even respond. By using the hand first you are placing the junction for the delineation of yin and yang (what is moving/ what is not moving) somewhere in the area of elbows or shoulder. By using the hand first you are creating a disconnect right where the shoulder meets the core. By using the hand first you are short circuiting and disrupting the flow of “qi”, placing the disruption somewhere in the hand/elbow/shoulder…there is no circuit completion of qi flow through the core to the arm…It only begins in the core when the hand leads the arm which engages and stretches the shoulder which is of course connected to the core. In other words it stops then begins at the shoulder. Qi also going where yi goes. After a movement from the core however, the qi should flow to the arms and hands, the majority of internal energy should continue to circulate in the torso until needed. Using the hands first in Tai Chi almost sounds like the same way dancers, typists, piano players use their hands. As we said this acts to disrupt the flow of qi between the body and fingers. Using the core first insures that the localized nerve activity of the hands/arms remains dormant and lets the qi from the body take over. This is good reason to learn the square form of Tai Chi, so that a practitioner can get used to movements with steady arms and hands without localized nerve impulses. Wu Chien Chuan (who stayed at Yeung Wabu’s home in Hong Kong circa 1938, with lessons going on night and day) himself told Yeung Wabu: “Every movement in Tai Chi Form has to have two complementary parts of the body, a moving (yang) part and a stationary part (yin). When the Yin-Yang junction is located in the torso of the body it is an internal move. When it is outside the torso, it is an external move. This is the key to a methodology that enables Tai Chi practitioners to mobilize the core of the body for Tai Chi movements, to generate internal energy and internal energy circulation. I have done Tai Chi from both sides of the coin, hand first, waist first and the latter is the most powerful. Try doing this yourself using the waist first and keeping the hand still and you will see the difference in generation of power.